I had just finished The Mortal Instruments: City of Heavenly Fire, and I was having the worst hangover. I knew I wanted to read something else, but I also wasn't ready to leave Cassandra Clare's Shadowhunter world behind. I had to find a solution. I've known about The Infernal Devices for quite some time now, but I have always been reluctant to read the series. I'm not a fan of historical writing, and I knew that TID takes place in the 1870s. But, then I discovered that two characters who make appearances in City of Heavenly Fire are actually main characters from The Infernal Devices. And, voila! I had found a way to fill my Shadowhunter void at least until The Dark Artifices: Lady Midnight comes out next year. The Infernal Devices has done so much more than fill a void; it has given me yet another series of Clare's to love. Dare I say that I love The Infernal Devices more than The Mortal Instruments? When I read The Mortal Instruments: City of Bones, I was not hooked the way I was hooked with Clockwork Angel. I think that having some background knowledge about the Shadowhunter world--knowing what a parabatai is, knowing what an iratze and a stele are, knowing what the purpose of a Shadowhunter Institute is, etc.--definitely helped propel my liking of the book. But, there are also many other reasons why I fell in love with Clockwork Angel. The characters in The Infernal Devices are so lovable. I fell in love with Tessa, Will, Jem and all the inhabitants of the London Institute a lot faster than I did with the characters of The Mortal Instruments. However, there were some similarities between some of the characters in TID and TMI; for example there was a lot of Jace in Will. I also found that the characters of this series are incredibly complex. They all face a lot of internal struggles. There's Tessa, who learns that she has the ability to transform into anyone (living or dead). Discovering this supernatural talent causes her to question everything about her life. Then we have Will Herondale, the boy with lots of secrets. Will, for reasons unknown, abandoned his family when he was young and sought refuge at the London Institute, choosing the Shadowhunter life over his family's exiled-mundane lifestyle. And, finally there's Jem, Will's parabatai who also joined the Institute when he was young after his family was slaughtered by a demon. Jem suffers from a mysterious illness that will become very important to the plot of this trilogy in the next two books. I personally found this "illness" to be one of the most interesting character Achilles heels of the story. Jem's illness was very different subject matter for Clare to write about and I loved it. And, of course there's Magnus Bane, my favorite of all of Clare's characters. Magnus is just that character who I wish was my best friend--he's funny, charming, has a good heart, and is very resourceful. So, I was especially excited to find him in this series. 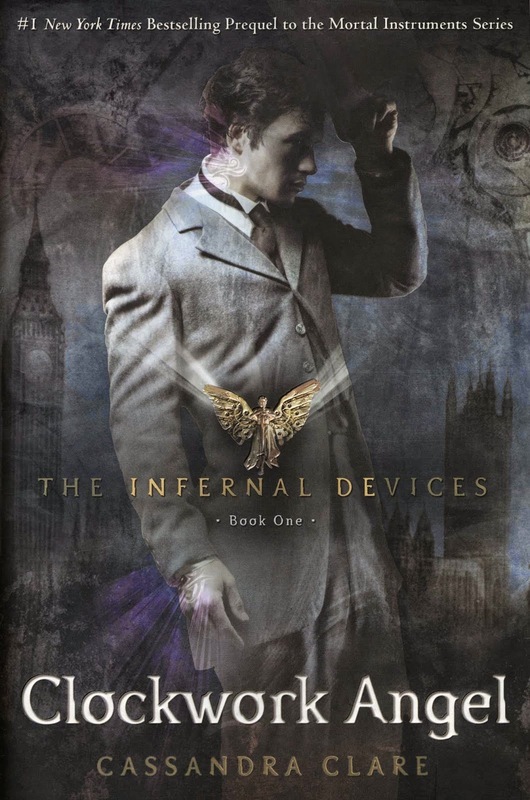 I think that the characters of The Infernal Devices are very different from any other characters Cassandra Clare has written (besides Magnus, because, ya know, he's still Magnus). You can't beat this set of diverse characters Clare has so perfectly crafted. I was reluctant to read TID because of the 1870s London setting, but I ended up really liking the story for that reason and I felt that the setting really added to the plot. With this book I was transported to a different era and to a city I've never been to. But, I couldn't say that about TMI. Cassandra Clare is especially talented at worldbuilding. I think that that's one of the reasons why I love her writing so much--I feel like I am literally in her world. And, she did an especially good job with this in Clockwork Angel. As is typical of Clare's works, in Clockwork Angel Shadowhunters go up against an evil villain who threatens to cause chaos and mass destruction in the world. That was expected; I wasn't surprised to find that this was the plot of the story. There is a villain, but the Shadowhunters do not know who he/she is. They know that the person's name is The Magister but there are a number of people who he/she could be. So, it's kind of like a game of clue within the plot! Fun! Tessa is the weapon the villain wants to use to do evil things. Our main character could become a weapon of mass destruction. How intriguing is that? It ain't a Cassandra Clare book unless it's got some witty humor. I think I've said this before in one of my Mortal Instruments reviews, but I'll say it again: Cassandra Clare is so good at making me laugh! One minute I'm heartbroken, the next minute I'm laughing. When I wrote about The Mortal Instruments, I talked about how I love Jace's dry humor and sarcasm. Now that role has befallen his ancestor, Will. You are going to have to read my Clockwork Prince review in order to get an in-depth explanation of the perfection that is Will Herondale. It seems that sarcastic humor runs in the Herondale bloodline. As well a very amusing fear of ducks. Reading TMI, there were so many references to ancestors of the New York Institute Shadowhunters, like Will Herondale, and I never quite understood them. But, now everything makes sense. Especially the end of CoHF. What I love most about Clare's Shadowhunter Chronicles is that they are all connected. All of her characters are connected in some way whether they know it or not. And, there is something very beautiful about that. It kind of makes you think of all the people out there that you are connected to, and you don't even know it. You may never meet them. But, it's the possibilities that matter. Needless to say, I really loved this book. This series is soooo good. If you've read The Mortal Instruments but haven't made it to The Infernal Devices yet, stop waiting! I realize that I did myself a terrible injustice in waiting so long to read these books, so don't do what I did! I have completed this series, and I will tell you that it is better than The Mortal Instruments. There, I said it. The Infernal Devices is better than The Mortal Instruments. Stay tuned for my reviews of Clockwork Prince and Clockwork Princess! 1) Have you read Clockwork Angel? What did you think? 2) Did you read TID or TMI first? How did that affect your reading experience? 3) Which of Clare's series do you like better? The Infernal Devices is a spectacular series! It really does fill in all the blanks left behind from TMI. I read the two series in tandem, and it really enhanced the experience. I read the first three TMI books, then the first two TID books, then CoFA and CoLS, then Clockwork Princess, and finally City of Heavenly Fire. It was a great way to read them, and you'll soon see why ;). I think the characters in TID are AMAZING (WILL HERONDALE) and I fell in love with them! I hope you love the rest of the series. Ugh! I wish I could go back in time and read them how you read them. I think that's the order Clare recommends they be read in. Everything would have made so much more since. It all would have just clicked! whoops, I guess you DID love the rest of the series, I skipped ahead and posted that too quickly! BUT IT WAS SO GOOD RIGHT?